What's the most underused productivity tool in your home or office? Your printer. Confined within that unassuming box, however, is a lot of power--far more than you might imagine. We've assembled ten printer downloads that can reduce paper and ink consumption, print out CD and DVD labels, create posters, and generate business cards--and that's just a start. Check out these free and affordably priced utilities. They're the best way to unlock your printer's potential. Over the life of your printer, you'll spend much more on paper and cartridges than you did on the printer itself. Any of the following four downloads can help you lower those costs--and cut down on waste, as well. If you're thinking about ways to save paper, you might consider not printing at all. Instead, turn your documents into PDF files and archive them electronically: Not only will you save money, but you'll make filing and retrieving the documents much easier, too. And you can always choose to print the PDF later. Bullzip PDF Printer does a superb job of turning anything you can print into a Portable Document Format file. It installs as a printer driver; to create a PDF from a document, simply select Bullzip PDF Printer rather than your normal printer in any application's Print dialog box. The utility offers plenty of options. You can, for example, add a watermark to the file, merge multiple documents into one PDF, password-protect the file, and determine the quality level so that it's suitable for a computer screen, an e-book, printer output, or even prepress output for professional work. You also have the choice of turning the document into an image file (in one of many common formats, such as .jpg, .png, .bmp, or .tif) rather than a PDF. Bullzip PDF Printer is actually a front end for the public-domain Ghostscript PostScript/PDF printer driver, and it does a great job. If you don't have the Ghostscript PostScript/PDF printer driver on your PC already, Bullzip PDF Printer will automatically download and install it for you, making for a simple installation process overall. Here's a great way to save paper and gain control over anything you print. FinePrint allows you to print two pages, four pages, or eight pages on a single sheet of paper, as well as to print double-sided pages. It can print out booklets and stationery, too, and combine multiple projects into a single print job. And since FinePrint installs as a printer driver, it's quite easy to use. FinePrint also lets you eliminate ink-and-paper-wasting graphics from Web pages and other documents before you print them. In addition, if you own a color printer, you can conserve color ink by instructing FinePrint to output in grayscale rather than color. Before printing anything, it previews the job and lets you delete entire pages or sections that you don't want printed. You can also print watermarks, such as "Draft" or "Confidential," on your output. 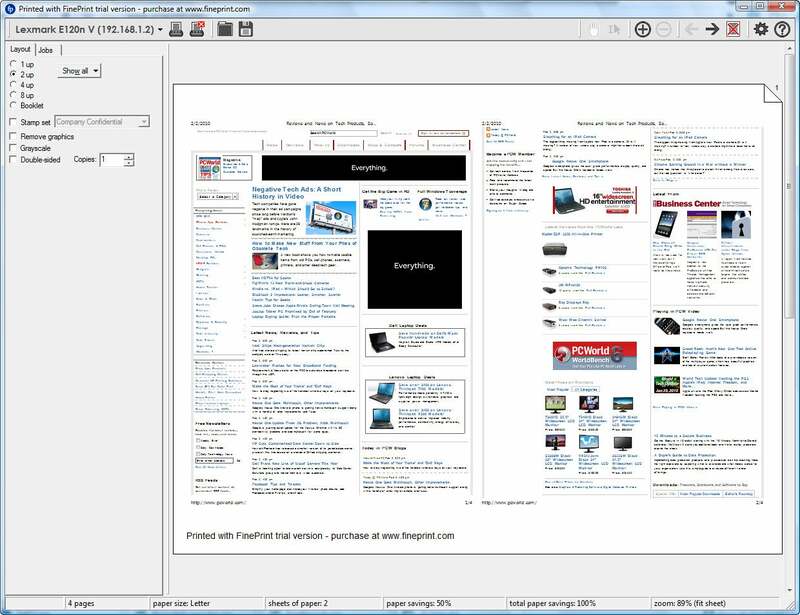 Be aware that the unregistered version of the utility prints out an ad for FinePrint at the bottom of your pages. If you want the ad to go away, you'll have to pay and register. Looking to cut your ink and paper consumption while whittling down your printer costs? Give the free GreenPrint World a try. 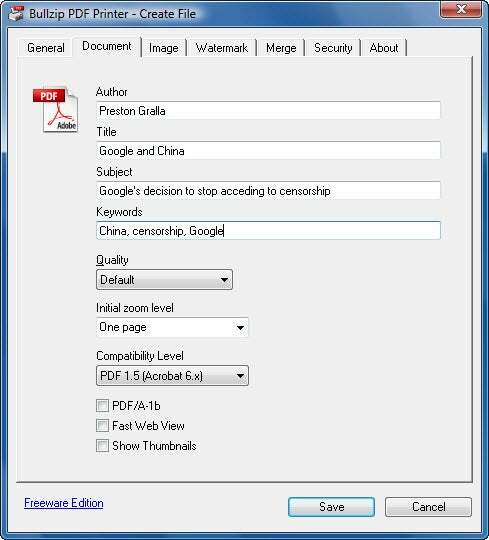 This useful, clever program will remove pages that it determines are unnecessary, such as those with no text on them. 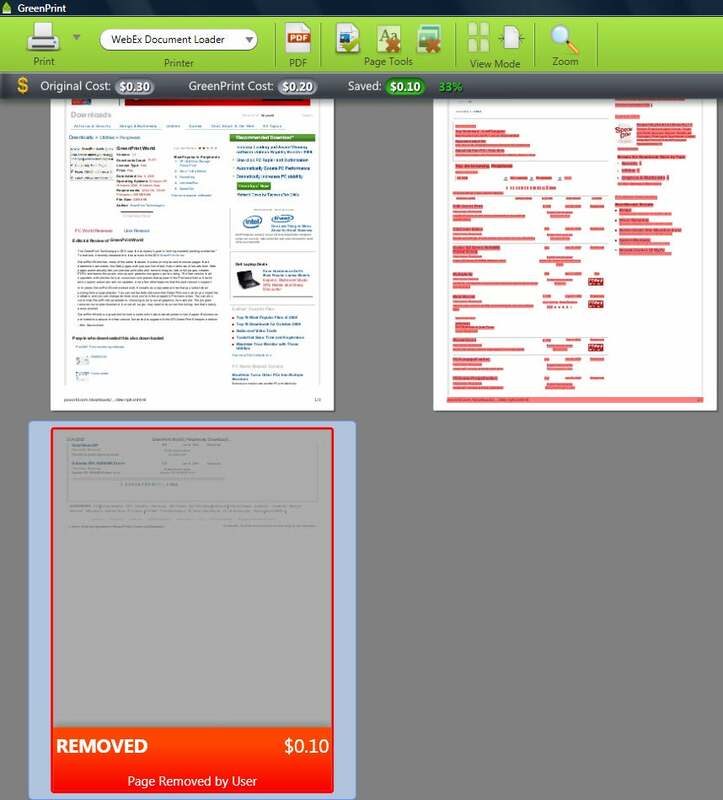 It also permits you to remove images or text from pages, or to delete whole pages, before printing. Alternatively, you can create PDFs from the pages instead of printing them, saving even more ink and paper. The program is simple to use. Like the two utilities above, it installs as a printer driver; when you're ready to print, you just select it rather than your normal printer. It previews your pages so that you can remove any unwanted portions before it proceeds. 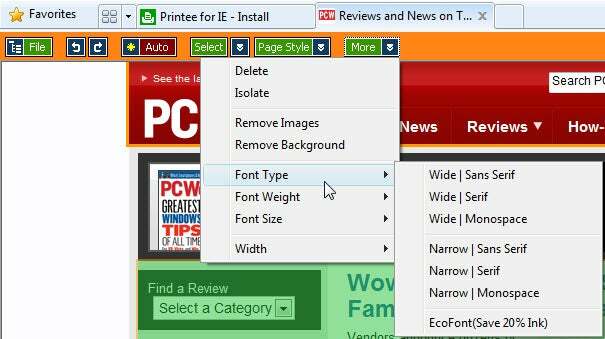 If you're looking to save ink and paper when printing from Internet Explorer, consider the free Printee for IE, which works as an IE toolbar. Click the Printee button, and a series of buttons appear just below Internet Explorer's tabs. With these controls you can perform actions such as removing images from a page, deleting the page's background, selecting portions of the page that you want to print, changing the width, and so on. Note that for the toolbar to show up, you'll have to restart Internet Explorer after you install Printee for IE. Even then, you might not see it as being available because it appears on the right side of the toolbar; to make it visible, you may have to click the double arrow at the right side of the toolbar. Upon running the program for the first time, you might find it confusing. When you first reveal the Printee toolbar, the links on the current Web page won't work--if you click a portion of the page, it turns green, which means that you've chosen to print it. Click the Print Preview button to review what you're about to print, and click the Print button to output it.